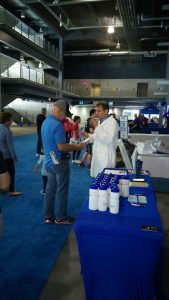 ESATM at the MetLife Stadium Health and Fitness Expo! 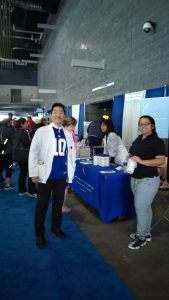 The Eastern School of Acupuncture and Traditional Medicine’s staff, faculty and students had another great experience at the May 2017 NBC/Telemundo MetLife Expo presented by Quest Diagnostics. The event is free and open to the public generates people from all around the tristate area. Events included healthy cooking demonstrations, yoga, medical screenings, autograph sessions with former and current members of the Giants football team and of course acupuncture consultations and free treatment coupons from ESATM. Attendees had access to the field where the Giants and Jets play which was full of activities, and also had access to the locker rooms and hall of fame room. The event truly has something for everyone. Since the mission of ESATM is to offer professional training, education and services in acupuncture, Oriental Medicine, and traditional healing modalities that enhance the health and well-being of the greater community. The Health and Fitness Expo is the perfect event to exercise this mission! 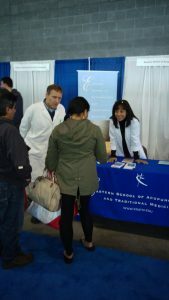 With the wide variety of attendees the ESATM team was able to interact with people who had already experienced acupuncture and people who had never heard of it. It was a great way to familiarize the community with Traditional Chinese Medicine and get the word out about the benefits of acupuncture. 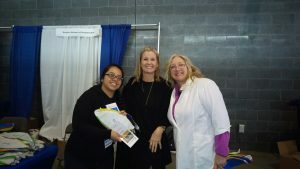 Here are some photos of the ESATM team working at the event!